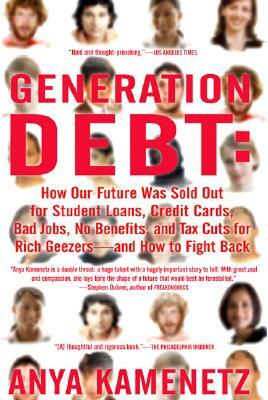 Generation Debt offers a truly gripping account of how young Americans are being ground down by low wages, high taxes, huge student loans, sky-high housing prices, not to mention the impending retirement of their baby boomer parents. Twenty-four-year-old Anya Kamenetz examines this issue from every angle and provides a riveting, rousing manifesto that will inspire everyone to take care of their financial future. Anya Kamenetz received her B.A. from Yale in 2002 and writes for New York magazine, Salon, The Nation, and The Village Voice, where she earned a Pulitzer Prize nomination for her contributions to the series "Generation Debt: The New Economics of Being Young." She has appeared on the NewsHour with Jim Lehrer as a spokesperson on the employment obstacles facing youth.